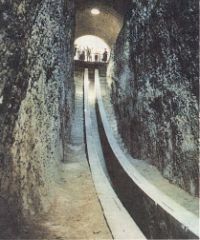 The observatory as an organised and state sponsored activity began with in the Islamic world. Much progress was made in this area, particularly in eastern parts of the Islamic world. This article was first published in the International symposium on the Observatories in Islam 19-23 September 1977 (ed. M. Dizer), Istanbul 1980, pp.. 21-32. Our knowledge concerning Al-Ma'mûn's observatories is scanty and mostly fragmentary. This situation is largely remedied, however, by two of our extremely well-informed and reliable sources. Al-Beyrûnî and Habash al-Hâsib have not only considerably enriched our knowledge on these institutions; the details supplied by them have also been helpful by bringing coherence to some of our otherwise isolated bits of information. Likewise, with their help, some key questions have received at least partial answers, and other interesting issues have been brought to light as materials for consideration and study. One of the essential conditions making up the observatory is graduated astronomical instruments. Such instruments had made their appearance in the Hellenistic era. But they went through noteworthy development in the world of Islam. Their number was considerably increased; they were improved and rendered more efficient from various standpoints and one important change compared to Antiquity was the large dimensions of the major observatory instruments. The increase of the dimensions of the instruments made it impossible or inconvenient to carry them from one place to another and undoubtedly thereby contributed to the birth of the observatory as a specialized institution. The mere construction of such instruments implied seriousness of purpose and engagement in a major enterprise. It was also clear evidence of an insistence on precise measurements. Moreover, such large instruments invariably made the cooperation of several persons necessary in taking measurements. Thus, this circumstance also contributed to the need of large groups of employees, although taken by itself such need could be met by using apprentices and other kinds of auxiliary employees. We have little knowledge concerning the instruments of Al-Ma'mûn's observatories. But the fragmentary information that can be gleaned from the sources is sufficient to show that they were not only of large size but that they contained new features as compared with Ptolemaic ones. The azimuthal quadrant is said to have figured among these instruments. In that case, it apparently would be its first example in the history of astronomical instruments. Moreover, there is good indication and convincing evidence, that work in the Shammasiyya and Qasiyun Observatories was quite specialized. We can come to this conclusion from the statements of Habash al-Hâsib and Al-Beyrûnî which make it clear, for example, that the Shammasiye and Qasiyun Observatories were quite distinct from the House of Wisdom and that the various geodesic measurements organized by Al-Ma'mûn were connected with the translation work at the House of Wisdom and not with the work done in the observatories. Ordinarily, the major task of an Islamic observatory and its traditional program of work was the construction of astronomical tables. In Al-Ma'mûn's observatories, only solar and lunar tables were prepared. 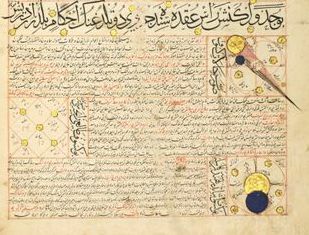 But there is also a star catalogue made by Al-Ma'mûn's astronomers, and sources contain references to planetary observations made in his observatories. These planetary observations were apparently of a sporadic nature. Habash al-Hâsib supplies us with valuable information concerning the nature of work in these observatories, indicating that the observation activity was quite intense. He speaks of regular daily observations of the sun and the moon. This means a regular pursuance of these bodies' across the sky. Such was the practice of Tycho Brahe for planets also, and the data collected by him on the trajectory of Mars enabled Kepler to discover his laws of planetary motion. Apparently, this procedure was not exceptional in Islam. We really know very little about it, but examples of a similar nature are found through the centuries. 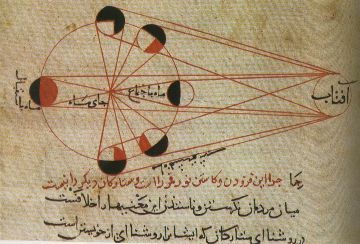 Al-Beyrûnî, from the first half of the eleventh century, is seen not only to speak of daily observations but also of a method of determining the solar parameters from data based on such observations. 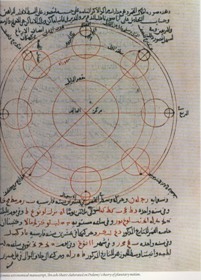 Jâbir ibn Aflah of the twelfth century also speaks of daily observations of the sun, and Al-Birjandî, from the fourteenth century, says that longitudes and latitudes of the planets should be observed every day but that, as this is very difficult, measurements at intervals such as two weeks are recommended. Projects, programs, organization, and efficiency of administration come to the fore when dealing with an institution such as the observatory. First-rate discoveries , on the other hand, can rarely be planned in advance, and truly creative research will usually transcend previously made plans. We should therefore not necessarily expect very original or epoch-making discoveries to result from the work in Al-Ma'mûn's observatories, where the main objective was the construction of tables. But according to Ibn Yunus the work carried out in Shammasiye and Qasiyun resulted in the discovery of the movement of the solar apogee. This is clear evidence that work in these institutions was not of a single-track mechanical nature aiming solely at the construction of tables, or the bringing of the older ones up to date, but that it also involved research in pure astronomy. There are references to astronomers who directed, or supervised, the other members of the staff in their work, or, who were in charge of the observations. Statements that are more clear-cut would be desirable, but even these occasional assertions imply some kind of organization. It would not perhaps be safe, however, to conclude on the basis of these statements that Al-Ma'mûn's observatories had a director each, as well as other auxiliary employees. Later observatories are known to have directors, treasurers, clerks, librarians, and other administrative officers, in addition to their staff of scientists. Of these, we cannot speak in connection with Al-Ma'mun's observatories, though the scientific staffs made up of fully-fledged astronomers seem to be rather impressive in these first observatories too. The Islamic world introduced the novel features of fixed location, large and fixed instruments, programmes of work, a scientific staff made up of several astronomers and royal patronage or affiliation with the state. These are all novel features for a place of astronomical work or observation. Nothing comparable can be found in Antiquity. Al-Ma'mûn not only built the first observatory in Islam, but he arguably built the first observatory in the world or in history. The observatory made its first appearance in Islam as an organized and specialized institution for work in astronomy. Al-Ma'mûn's observatories did not enjoy long life. They did not survive their founder. But the very fact that royal or state observatories make their appearance in Islam is at least partial guarantee of them transcending their founders. Such a pronouncement could certainly not be made concerning private observatories. It is seen, nonetheless, that the observatory was looked upon in Islam not as essentially a permanent institution but as a temporary one. This is undoubtedly a consequence of its program of work, which was a theoretical minimum of slightly over thirty years, i.e., a period not shorter than the longest planetary period. A few observatories exceeded, reached, or even came close to this ideal, however. These were the Maragha Observatory founded by Hulagu and the Samarqand Observatory of Ulugh Beg, The Malikshah Observatory at Isfahan and the Tabriz Observatory of Ghazan Khan too may have enjoyed relatively long lives. But we cannot be sure of this at the present. It is nevertheless true that two personal observatories of quite early date set up by individual astronomers were scenes of work for quite a number of years. These were the observatories of the Turkish Banû Amajurs and their contemporary Al-Battânî from Harran. This brings us to the question of the place of private observatories, or the part they played, in the history of that institution. The part played by such observatories was probably quite important but undoubtedly indirect and secondary. For, as is seen from the observatories, astronomical research had come to require costly equipment and cooperation of many astronomers and this circumstance relegated the observatories of individual astronomers to the background. Good work could undoubtedly be done with small-sized instruments also; at least some types of work. But in that case they were portable and did not lead to the emergence of a fixed place of specialized and collective work. Observational work in Antiquity, including that of Ptolemy, was of this nature. It is clear that the observatory came into existence in Islam and that those founded by Al-Ma'mûn were far removed from what Antiquity had to offer as an approach. Yet, with the partial exception of two of its features that were closely interrelated, namely, the relative shortness of its life and the fact that the predominant item in its program of work was the study of planetary motions, the Islamic observatory went through noteworthy development within the Islamic world. Moreover, it made its appearance and thrived in Eastern Islam in particular, i.e., not so much in Spain and the Maghreb. This is true not only for observatories but also for elaborate observation posts. That this was not a mere coincidence seems to be corroborated when one looks more closely into relevant details. Let us proceed therefore to do so. 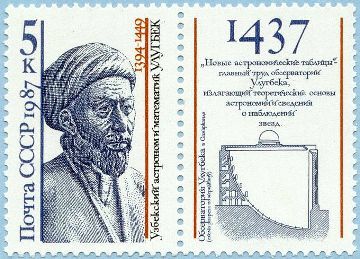 Of Al-Ma'mûn's astronomers mentioned above Khâlid ibn Abdulmâlik al-Marwrûdhî and Ibn Khalaf al-Marwrûdhî were from Marwrûdh, a city near the border of the present-day Afghanistan and Russian Turkistan. Yahyâ ibn Abî Mansûr was Persian and is said to have become a Muslim only after entering in the caliph's service. Abu Abdullah ibn Mûsâ al-Khwârazmî was from Khwarazm which is just south of the Aral Lake in the heart of Central Asia. Its population was Turkish and partly related to the Persians by peculiarities of language. Al-Khwârazmî seems to have been sent on a mission to the Turkish Khazars. He was therefore probably Turkish. There were other renowned astronomers who were Al-Ma'mûn's contemporaries though they were probably not connected with his observatories. One of these was Abu'l-Abbâs Ahmed ibn Muhammed ibn Kathîr al-Fargânî, from Farghana, to the northeast of Khwarazm and deep in Central Asia. He was also, very likely, Turkish. Another was Abu Ma'shar al-Balkhî, from Balkh. A third such person is Habash al-Hâsib al-Marwazî. He was from Marv, again from present-day Turkistan. All this would seem to indicate that the districts of Khorasan and Transoxiana, to use other geographical appellations for the same regions, must have greatly contributed to the rise of interest in astronomy in the world of Islam. And apparently this was not all. They also had a large share in supplying the scientists who were capable of doing such work. Abu'l-Fadl Nawbakht and his son Al-Fadl ibn Nawbakht too were among the first astronomers and translators of Islam. The name Nawbakht points to a Persian ethnic origin. Again, we find among the earliest and most prominent translators the Jewish Shal ibn Rabban at-Tabarî, from Tabaristan in northern Iran just to the south of the Caspian Sea. Another relatively early astronomer, Ahmed an-Nihawandî, should be a Persian, since he apparently originated from Nihavend in Western Iran. Finally, Khâlid ibn Barmak and his son Yahyâ ibn Khâlid ibn Barmak, who were among the first patrons of astronomical work, were from the above-mentioned city of Balkh, where Khâlid's father was at the head of a Buddhist temple when the Arab armies conquered the city for good. It should be noted in this context that of the nine major state observatories built in Islam three owed their existence to Turkish rulers. These were the Malikshah Observatory of Isfahan, the Samarqand Observatory of Ulugh Beg, and the Istanbul Observatory of Murad III. Two others belonged to the period of Mongol-Turkish rule. These were the Maragha Observatory of Hulagu and the Tabriz Observatory of Ghazan Khan. Of the remaining observatories two were founded by Al-Ma'mûn, one was founded in Baghdad by Sharaf al-Dawla, Buyid ruler of the tenth century, and the remaining single observatory was one whose construction or foundation was finally completed after failures and wrong plans of various kinds but in which apparently no work of any importance was ever done. This was in Cairo in the early parts of the twelfth century. The construction of this observatory was started by the Fâtimid vizier Al-Afdal and continued by his successor Al-Batâ'ihî. All this too is certainly significant. The Turks definitely come to the foreground in the observatory building activity of Islam. This is of course partly because, beginning with the Seljuks, Turks gained political supremacy and predominance in Islam. But as we have seen, in earlier periods too, regions where Turks lived had given rise to astronomers of great renown. It should be appropriate therefore to add here a few words on the astronomical activity of the Turkish Amajur Family who, as a group, made extensive observations between 885 and 933. The early date of their observations may be brought into prominence by noting that, among the royal observatories, they were preceded only by those of Al-Ma'mûn and among major personal undertakings of the kind by individual astronomers, there was only that done by the Banû Mûsâ Brothers, who were young contemporaries of Al-Ma'mûn and closely associated with him. They also originated from the district of Khorasan. Furthermore, the remarkably long stretch of the work by the Amajurs is exceptional even for the major royal observatories with longest lives. Europe established close cultural contact with Islam by becoming engaged in systematic and intense translation activities from Arabic scientific and philosophical works during the twelfth century, and this cultural contact did not cease thereafter. Alphonso X, Spanish king of the second half of the thirteenth century, made an attempt; it seems, to transplant the Islamic tradition of building observatories into Western Europe. But this did not succeed, perhaps because astrology was frowned upon by the Church and the perception of the utility of astronomy in the Christian World was rather weak in comparison to that prevailing in Islam. However, in the sixteenth century the situation gradually changed. By this time, knowledge of astronomy had gained in depth and breadth as compared with that of the thirteenth century. Moreover, Europe had managed to keep abreast of almost every kind of development in astronomical knowledge, theoretical as well as practical, that had taken place in the meantime in the Islamic world. As to the tradition of building observatories, the world of Islam had, by the sixteenth century, much more to offer as worthy of emulation than it had in the time of Alphonso X, when detailed knowledge concerning the distant Maragha was probably as yet not sufficiently available. Indeed, the parallel seen between the instruments of Taqî al-din and those of Tycho Brahe is quite remarkable. This was undoubtedly the result of knowledge that had come from Islamic lands. Indeed, no matter where we look there is unmistakable evidence showing this. If we look at Tycho Brahe's famous mural quadrant we immediately notice that it is of the type developed in Eastern Islam, and we see clearly marked on it the transversals, again a device that originated and was developed in Eastern Islam. If we turn to the Kassel Observatory of Wilhelm IV (1532-1592), we find that he has the azimuthal quadrant, which, as we have seen, probably dates from Al-Ma'mûn's time as an observatory instrument, and this also should be indicative of influence coming from Eastern Islam. It was indeed very popular there. Copernicus himself owed much to knowledge derived from Eastern Islam. His revolving parallactic ruler is a clear testimony to this fact. Indeed, this instrument, which was peculiar to Eastern Islam, was probably never used outside of the Maragha and Samarqand Observatory circles. Moreover, in working out the details of his system Copernicus had recourse to the use of double epicycles in the same way as Ibn ash-Shâtir had done some two hundred years previously. This is quite remarkable. But, as is coming to be known rather widely, Copernicus also used a device consisting of two circles, whose radii have the ratio of two to one, the smaller circle rolling within the larger one, always remaining tangent to it. This device had been used for the same purpose in the thirteenth century by Nasiruddin at-Tûsî, head of the Maragha Observatory. It would seem quite certain that these close similarities also were the results of knowledge received by Copernicus coming from Muslim scholars. There are even parallels between certain views of Tycho Brahe in astrology and those of Islam, which according to Mouradgea d'Ohsson thrived in Ottoman circles. Such examples may 'be multiplied further, especially if we do not restrict ourselves to the field of astronomy. There was undoubtedly much exchange of ideas and especially transfer of knowledge from the East to Western Europe. During the period stretching from the time of the Maragha Observatory to that of the Samarqand and Istanbul Observatories important textbooks were written and an unbroken line of astronomers was produced. Many of these contain, or actually are, commentaries on more important books. One finds, for example, Nasiruddin's above-mentioned device described and explained in several fourteenth and fifteenth century books on astronomy. As to the Ottoman capital in particular, in the period spanning the lifetime of Copernicus and a couple of generations before him, including, say, that of Regiomontanus, there were at least two renowned astronomers there. These were Ali Kushji (d. 1474) and Mîrîm Chelebi (d. 1525), not to mention Taqî al-din who belongs to a slightly later era. They were both well versed in mathematics as well as in theoretical and practical astronomy. They certainly were intimately acquainted with achievements in Eastern Islam in the fields of astronomy and mathematics and could serve as transmitters of all such knowledge to Western or Central Europe. By the beginning of the sixteenth century the whole of the Balkan Peninsula and even part of Central Europe had come under Turkish rule. Isolation and aloofness could not under these conditions very well represent the prevailing and predominating circumstance or state of affairs. In fact, the situation was quite the opposite. During the reign of Muhammad the Conqueror and Suleyman the Magnificent, cultural contact between Turkey and Europe had reached its peak and was especially lively in Istanbul. Several Italian painters and men of letters are known to have visited Istanbul and to have stayed there for periods of different lengths. Gentile Bellini, Italian painter, resided in Muhammad the Conqueror's court for several months during the years 1479-1480. In the opening years of the sixteenth century, Leonardo da Vinci designed a plan for a bridge across the Golden Horn in Istanbul, and his plan as well as a letter concerning it has been preserved to our day. Regiomontanus was a contemporary of Ali Kushji and Muhammad the Conqueror, while Copernicus was a contemporary of Suleyman the Magnificent who ruled from 1520 to 1561 and during the early years of whose reign diplomatic activity of the Ottomans with all parts of Europe reached a high pitch. Indeed, Istanbul with its active commercial dealings especially in maritime trade and its thriving Venetian, Genoese, and Ragusan colonies, was a metropolis well suited to traffic in ideas and cultural contact between the East and the West. It was itself the foremost representative and repository of Islamic science and culture. The European mathematicians Mordecai Comtino (d. 1478) and Elia Misrahi (1456-1526) - were very familiar with the Ottoman capital, and, in fact, both died there. Comtino gave one of the early examples of the use of positional decimal fractions in Europe, and Misrahi is known to have brought from Istanbul to Basel important summation formulas used somewhat later by such mathematicians as Bonaventura Cavalieri (1598-1647) in their work paving the way toward the emergence of the integral calculus. Both Comtino and Misrahi were carriers of influence originating especially from the work of Ghiyâthuddin al Kâshi (or Kâshânî), one of Ulugh Beg's co-workers in the Samarqand Observatory. It is not surprising therefore, to see that in the fifteenth and the sixteenth centuries Europe was well-informed and had kept abreast of developments in theoretical and practical astronomy that had been discovered in Eastern Islam. So it is that the Turkish-Islamic World in general and the city of Istanbul in particular served efficiently as a fountainhead and a vehicle for the transfer of a great deal knowledge to Europe. Sayili, the Observatory in Islam, pp. 71-74. Sayili, the Observatory in Islam, pp. 53-56. Sayili, the Observatory in Islam, pp. 75-84. Sayili, Fifth Turkish Historical Society Congress, 1956, Proceedings, pp. 252-257; Sayili, "The Introductory Section of Habash's Astronomical Tables", pp. 150-151, 144; S. Tekeli, "Nasiruddin, Takiyuddin ve Tycho Brahe'nin Rasat Aletlerinin Mukayesesi", DTCFD, vol. 16, No. 3-4, 1958, pp. 388-391; Sayili, The Observatory in Islam, pp. 68, 280, 316-317, 320, 321; Tekeli, "Bîrûnî's Method on Finding the Solar Parameters", Belleten, vol. 27, 1963, pp. 35-36. Sayili, The Observatory in Islam, p. 77. Sayili, The Observatory in Islam, p. 349-354. Tekeli, "Nasiruddin, Takiyuddin ve Tycho Brahe'nin Rasat Aletlerinin Mukayesesi", pp. 301-393. Victor Roberts, "The Solar and Lunar Theory of Ibn ash-Shâtir", Isis, vol. 48, 1957, pp. 428-432; E.S. Kennedy and Victor Roberts, "The Planetary Theory of Ibn ash-Shâtir", Isis, vol. 50, 1959, pp. 227-235; O. Neugebauer, The Exact Sciences in Antiquity, 1957, pp. 203, 204, 206; Willy Hartner, "Copernicus, the Man, the Work, and its History", Proceedings of the American Philosophical Society, vol. 117, 1973, pp. 416-417. Sayili, the Observatory in Islam, pp. 41, 43. See Aydin Sayili, "Islam and the Rise of Seventeenth Century Science", Belleten, vol. 22, 1958, pp. 253-268.